Ryan Patrick McDonagh (born June 13, 1989) is an American professional ice hockey defenseman and alternate captain for the Tampa Bay Lightning of the National Hockey League (NHL). Drafted in the first round, 12th overall, by the Montreal Canadiens in 2007, he played college hockey for the Badgers at the University of Wisconsin–Madison. He also played for the New York Rangers, for whom he served as team captain from October 2014 until being dealt to the Lightning at the 2018 trade deadline. McDonagh also competes internationally for the United States and was a member of the men's ice hockey team at the 2014 Winter Olympics in Sochi. McDonagh attended Cretin-Derham Hall High School in Saint Paul, Minnesota, where as a junior he helped lead his team to the school's first state hockey championship. The following season, he was awarded the 2007 Minnesota Mr. Hockey award, which is given annually to the top senior high school hockey player in the state. He was then drafted in the first round, 12th overall, by the Montreal Canadiens on June 22, 2007, in the 2007 NHL Entry Draft. He also won a silver medal with Team USA at the 2007 IIHF World U18 Championships. Two years later, he represented the Americans at the 2009 World Junior Ice Hockey Championships. On June 30, 2009, McDonagh's rights were traded, along with Chris Higgins, Pavel Valentenko and Doug Janik, to the New York Rangers in exchange for Scott Gomez, Tom Pyatt and Michael Busto. 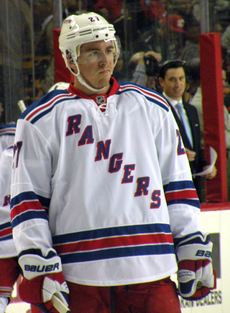 On July 6, 2010, McDonagh signed an entry-level contract with the Rangers, forgoing his senior season at Wisconsin and joining childhood friend and former Wisconsin teammate Derek Stepan in New York. After beginning the 2010–11 season with the Rangers' American Hockey League (AHL) affiliate, the Hartford Wolf Pack, he was promoted to the Rangers on January 3, 2011. He played his first career NHL game against the Dallas Stars on January 7, 2011. He then earned his first NHL point on an assist of a Brandon Prust goal against the Carolina Hurricanes on January 20. On March 20, McDonagh was the victim of an elbow to the head from Pittsburgh Penguins forward Matt Cooke, who was subsequently suspended for the remainder of the regular season and the first round of the 2011 playoffs. On April 9, 2011, McDonagh scored the game-winning goal, the first of his career, against the New Jersey Devils, earning the Rangers the eighth and final playoff spot in the Eastern Conference. As a result of the 2012–13 NHL lockout, McDonagh signed a contract with Barys Astana of the Kontinental Hockey League (KHL). He became the first American NHL player to join the KHL as a result of the lockout. On July 8, 2013, McDonagh re-signed with the Rangers to a six-year contract worth $28.2 million. He led all Rangers defensemen with 43 points in the 2013–14 season as the Rangers finished fifth in the Eastern Conference. The team defeated the Philadelphia Flyers, Pittsburgh Penguins and Montreal Canadiens en route to the 2014 Stanley Cup Final against the Los Angeles Kings, where the Rangers ultimately lost the series 4–1. During the playoffs, McDonagh was tied for the lead amongst defensemen in assists (13) and ranked second in points (17). For his season's efforts, McDonagh was named Rangers' MVP and the recipient of the Players' Player Award, given to the Ranger "who best exemplifies what it means to be a team player." He became just the second Rangers defenseman to hold both awards after Brian Leetch did so in the 2002–03 season. McDonagh in a game against the New York Islanders, 2013. On October 6, 2014, McDonagh was named the 27th captain in Rangers history, filling the vacancy left by Ryan Callahan the previous season. Martin St. Louis, Marc Staal, Dan Girardi and Derek Stepan were named his alternates. McDonagh became the fourth-youngest Ranger captain and 11th defenseman to hold the honor. In his first season as captain, he led his team to the Presidents Trophy and were ultimately eliminated in the Eastern Conference Finals by the Tampa Bay Lightning in a hard-fought seven-game series. On May 30, 2015, after the Rangers lost the Eastern Conference Finals against Tampa Bay, it was revealed that McDonagh had been playing the last three games with a broken foot. McDonagh continued his strong play and leadership into the 2015–16 season, his second as team captain. However, during a February 6, 2016 game between the Rangers and the Philadelphia Flyers, McDonagh suffered a concussion after getting punched by Flyers' forward Wayne Simmonds after McDonagh cross-checked Simmonds. McDonagh missed 8 games as a result, including a February 14 rematch between the two teams, during which Rangers' rookie defenseman Dylan McIlrath fought Simmonds. Still feeling the effects of the concussion, McDonagh's defensive play during the Rangers' first-round playoff series against the Pittsburgh Penguins was poor, and the Rangers were eliminated in 5 games by the Penguins, who went on to win the Stanley Cup that year. On February 26, 2018, the Rangers traded McDonagh along with J. T. Miller to the Tampa Bay Lightning in exchange for Libor Hájek, Brett Howden, Vladislav Namestnikov, a first-round pick in the 2018 NHL Entry Draft, and a conditional second-round pick in the 2019 NHL Entry Draft. On April 18, 2018, McDonagh skated in his 100th career NHL playoff game. On July 19, 2013, McDonagh married long-time girlfriend Kaylee Keys at Our Lady of Victory Chapel in his hometown of Saint Paul, Minnesota. The couple had their first child together in October 2016. Former National Football League (NFL) quarterback Steve Walsh is McDonagh's uncle. ^ Minnesota Wild. "Cretin-Derham Hall's Ryan McDonagh Named Mr. Hockey". Minnesota Wild. Archived from the original on July 5, 2009. Retrieved April 20, 2007. ^ "U.S. Roster for IIHF World Under-18 Championship Named". Retrieved April 23, 2011. ^ "2007 USA Player Statistics by Team" (PDF). IIHF. Retrieved May 13, 2011. ^ "2009 USA Player Statistics by Team" (PDF). IIHF. Retrieved May 13, 2011. ^ "Montreal Canadiens acquire Scott Gomez from New York Rangers". ESPN. June 30, 2009. Retrieved July 1, 2009. ^ "McDonagh truly a happy camper". New York Rangers. Retrieved July 7, 2010. ^ "McDonagh turning pro with Rangers". New York Rangers. Retrieved July 7, 2010. ^ "McDonagh getting first shot at NHL". nhl.com. Retrieved January 3, 2011. ^ "Rangers vs. Stars". Yahoo!. Retrieved January 7, 2011. ^ "Rangers never say die in win at Dallas". New York Rangers. Retrieved January 8, 2011. ^ "Rangers Ward-ed off by a hot goalie". newyorkrangers.com. Retrieved January 21, 2011. ^ "Carolina 4, NY Rangers 1". Yahoo!. Retrieved January 20, 2011. ^ Brooks, Larry (April 10, 2011). "Rookie McDonagh nets game-winner for Rangers". New York Post. ^ RIA Novosti (October 11, 2012). "Ranger McDonagh First American in KHL Lockout Switch". Ria Novosti. Retrieved October 13, 2012. ^ "Ryan McDonagh re-signs with NY Rangers, inks six-year, $28.2 million deal". NY Daily News. Retrieved July 8, 2013. ^ "Rangers defenseman Ryan McDonagh out 3-4 weeks". NHL.com. Retrieved January 19, 2015. ^ "Ryan McDonagh Named 2013-14 Team MVP & Winner Of Players' Player Award". NHL.com. April 11, 2014. Retrieved February 7, 2019. ^ "McDonagh named captain of the New York Rangers". The Globe and Mail. Retrieved January 19, 2015. ^ "New York Rangers eliminated by Tampa Bay Lightning". NJ.com. Retrieved May 29, 2015. ^ "Rangers captain McDonagh had broken foot". NHL.com. Retrieved May 30, 2015. ^ "Ryan McDonagh out with concussion following punch from Wayne Simmonds". cbc.ca. February 8, 2016. Retrieved February 7, 2019. ^ Peters, Chris (February 15, 2016). "WATCH: Rangers, Flyers open game with two fights in first minute". cbssports.com. Retrieved February 7, 2019. ^ "Lightning acquire D Ryan McDonagh, F J.T. Miller from New York Rangers". NHL.com. February 26, 2018. Retrieved February 27, 2018. ^ Satriano, David (April 18, 2018). "Lightning add to series lead with Game 4 win against Devils". National Hockey League. Retrieved April 19, 2018. ^ "New York Rangers Hockey Player Marries High School Sweetheart in Minneapolis". Style Me Pretty. ^ Mara Siegler; Jaclyn Hendricks (October 18, 2016). "Rangers captain Ryan McDonagh and wife welcome first child". pagesix.com. Retrieved April 10, 2018. ^ Botta, Christopher (February 4, 2012). "Rangers' Super Sunday Will Kick Off With a Game Before That Other Game". New York Times. Retrieved February 7, 2012. ^ a b National Hockey League (2010). The National Hockey League Official Guide & Record Book/2011. Triumph Books. p. 316. ISBN 978-1-60078-422-4. Wikimedia Commons has media related to Ryan McDonagh. This page was last edited on 17 April 2019, at 03:18 (UTC).